We were at the beach for the last few days, and I have nothing to show for it yet except lots of photos of sea gulls. 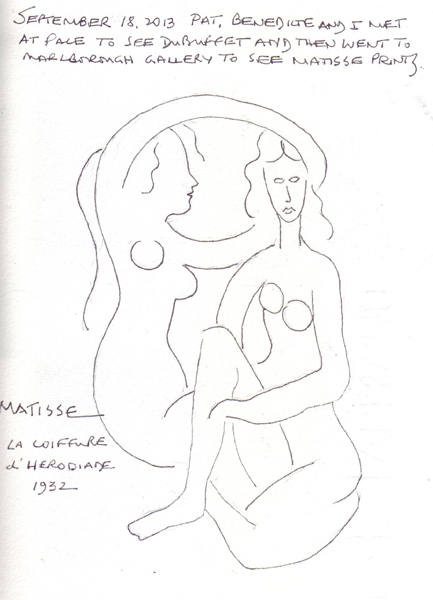 However, Pat, Jana Bouc, and I went to MoMA during Jana's NYC visit, and while wandering around the permanent collection, I sketched a Matisse sculpture. I stopped and looked at this sculpture for much longer than usual because I was watching 3 women in plastic gloves feeling the small statue. The woman wearing a black suit (museum personnel?) was specifically having them feel every part of the statue and even explaining the shapes of the negative spaces. Then it became apparent to me that one of the other women was blind and the remaining one was guiding her around the museum. What a wonderful program. My week was very unusual. I spent a total of 8 hours in 3 figure drawing sessions - my FIT class, and the Battery Park afternoon session and an evening at the Society of Illustrators with my friend Pat and Jana Bouc, who was visiting from San Francisco. In total I sketched 45 figures! I started a sketchbook for my grand daughter Annabelle when she was born. Since she lives in DC, I printed out my prior sketches from around her neighborhood and collaged them on the first 2 pages. Since then I fill a sketchbook page for every day that we visit her - and now her little brother William. 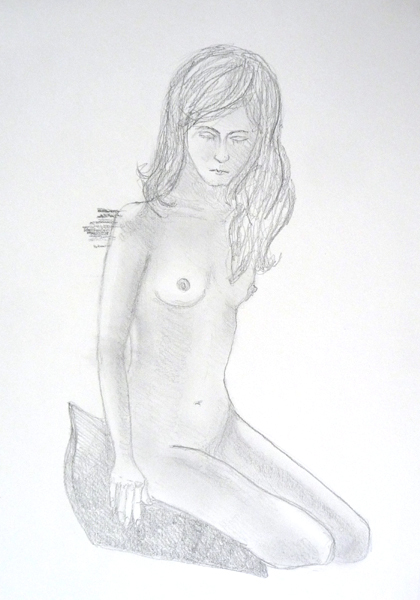 Some previous blog posts from this sketchbook can be seen here. The sketchbook is a Cachet Linen Watercolor Sketchbook and because I could use both sides of every page, I completed 50 pages. We visited Annabelle and William last weekend. She is now 5 and loves to draw and paint, so we spent lots of time together at the dining room table. I collected leaves and maple seed pods on our walk home from her school and we painted them in the evening. Annabelle is an official Nationals Junior Fan and has seen more baseball games in her short life than I saw in in my whole lifetime. She wanted me to add their mascot to the sketchbook, so that became the next page. Annabelle told me that Henry, another kindergarten student, is her boyfriend and she wanted to build a castle for them to live in when they are married. The problem, the castle is going to be built in her cellar. We also talked about her dance classes. So I had to combine her castle, a crown, and her ballet shoe on the final page. Pat, Benedicte, and I visited two 57th St Galleries before our Figure Drawing session in Battery Park City. 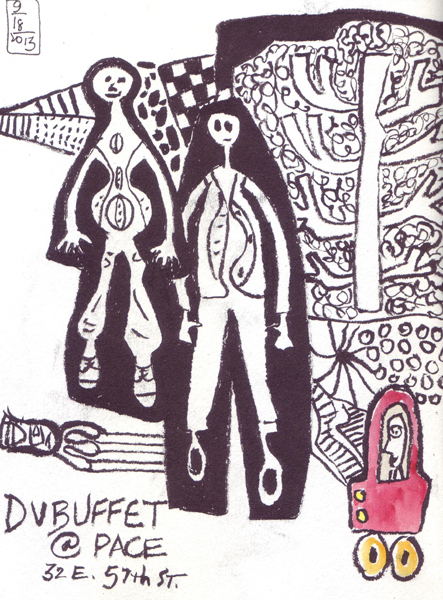 Pace Gallery: There is a Dubuffet show of 52 of his drawings from 1975 to 1985 - and most of them are wonderful black and white doodles. I sketched figures from two different drawings, a tree from a third - and then the red car from another. The exhibit ends on October 26th. 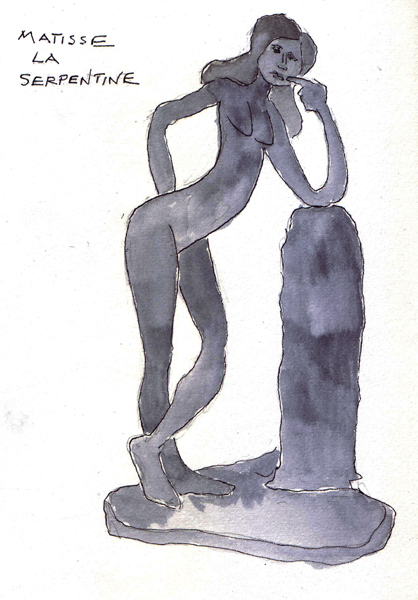 Marlborough Gallery has over 80 Matisse Prints which were done between 1900 and 1950. There were simple line figure drawings and more detailed prints of women in his classic clothes and settings. 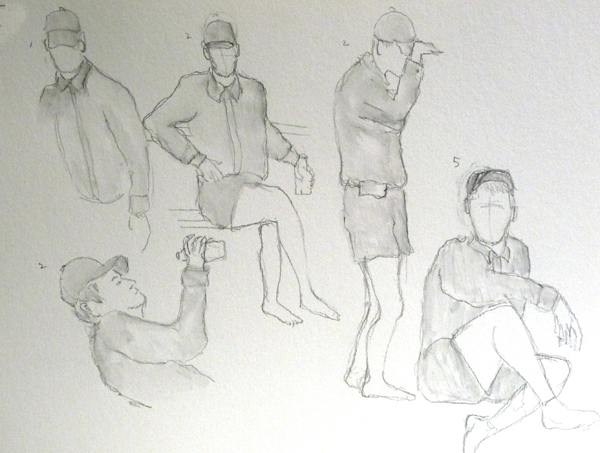 I love the simplicity of his classic figure drawings and always hope that by drawing them, I am incorporating some of his skills into my drawings. Wishful thinking! We were in DC for a few days visiting our family and while everyone was at work or school, my husband and I spent several hours at the National Gallery of Art East Wing. 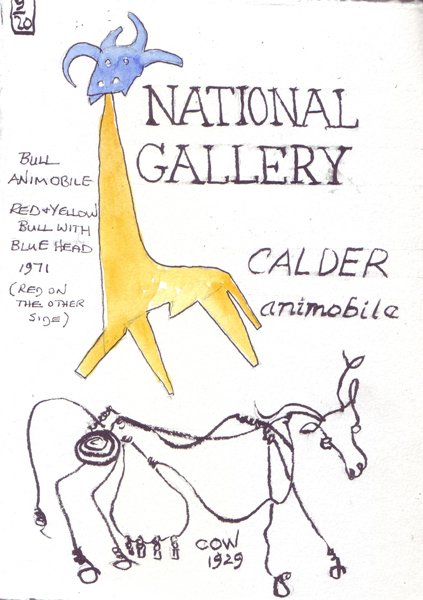 There was a small, but terrific Alexander Calder exhibit - with mobiles, wire sculptures, and 6 animobiles. I sketched a bull - and then the wire cow. The cow is only about 12 inches long and 6-8 inches high - perfect size for an apartment! More wishful thinking! Last Week Pat and I spent 2 full days out and about. On Friday we went to Christies to see the previews for the South Asian Modern + Contemporary Art in the morning and the preview for the huge Interwoven Globe exhibit at the Met in the afternoon. 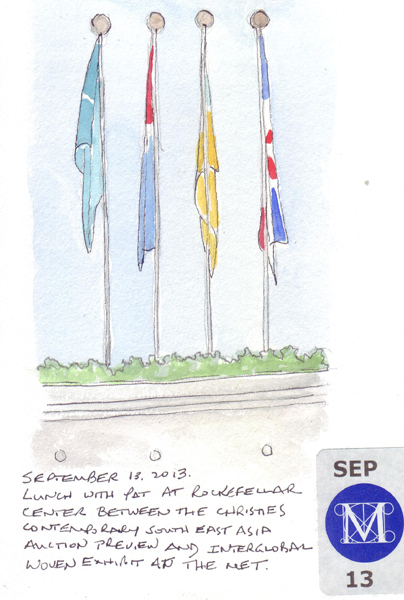 Lunch in Rockefeller Center was a wonderful break between these two events and I sketched a few of the flags while we were eating and resting. 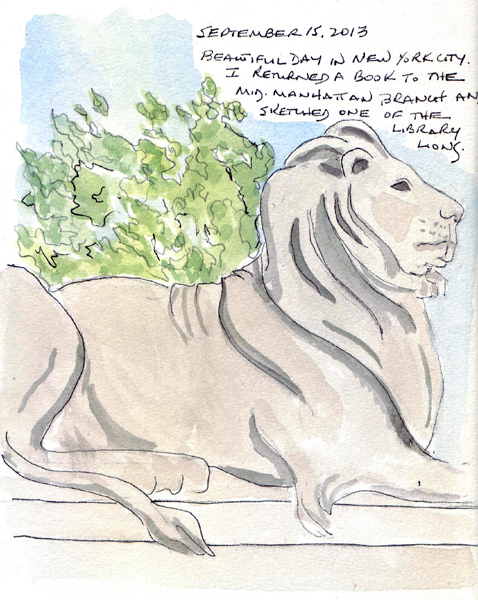 On Sunday I went to the New York Public Library to return a book, and couldn't resist standing in the sun and sketching one of the Lions that welcome visitors to the Main Library on both sides of the stairs. I was returning a book to the Mid-Manhattan branch (a circulating branch across from the big Research Library) and I found two terrific books in the drawing section. I brought home one to read and will borrow the other one on my next visit. The first is: More Than Words: Illustrated Letters from the Smithsonian's Archives of American Art. Liza Kirwin, 2005. The second is: Queen Victoria's Sketchbook by Marina Warner. I looked through the entire book and was surprised to learn that she kept a sketchbook during her entire life. Many drawings are in pen and ink, others also were painted with watercolor. She sketched people in her life, opera characters, ballet costumes, and occasional places. When I have time, I'd love to read it.